Will this disturb the functioning of my dining room if we shoot at my restaurant? Food photography takes more space then most people think. 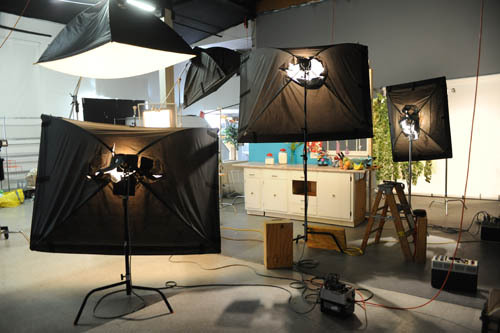 Besides the camera and photographer, these are the lights, umbrellas, light boxes, the computer, and the food styling area. All in all, I like to dedicate at least 15’ x 15’, and that’s pushing it. The actual photography can be distracting to your guests, but it can also be an amusement to some. I believe that if the environment isn’s actually going to be part of the photos, we’ve much better off photographing your food in my studio. My studio is 50’ x 50’ with a very well-equipped restaurant style kitchen, with lots of prep area. We also have tons of props and shooting surfaces and of course the photographic lights, light stands, cameras and lenses.